Every winter I tell myself I should learn how to knit. This winter I’m going to do it! My mother-in-law is helping me. 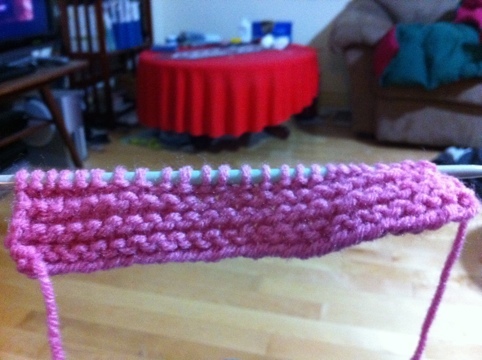 I’m still working on figuring out how to control my tension and make my stitches even. It is a work in progress, who knows what I can accomplish if I put my mind to and put some time into it. I guess we shall see. My MIL did the first couple of rows. I will learn how to cast on the next time. I will try that. Thanks! That looks great. You are a knitter. It would be nice if I can actually knit something more than a square by Christmas!